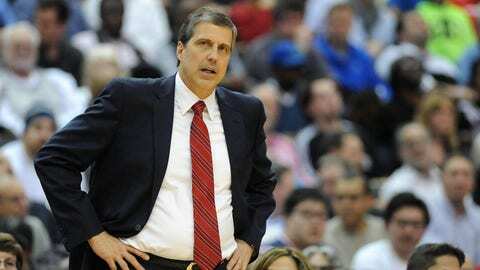 Randy Wittman has a big decision to make regarding his starting power forward. The Washington Wizards destroyed opponents last year when Marcin Gortat and Nene shared the floor, but head coach Randy Wittman seems intent on breaking them up and stashing Nene on the bench. It's a smart move. Washington wants to play fast and it wants to space the floor. That can't be done with Nene and Gortat mucking up the paint and dragging everything down in transition. But with just one relatively immobile big (Gortat) beside the starters and one headlining bench units (Nene), the Wizards can have their cake and eat it too. The only question now is who will replace Nene in the starting lineup? Kris Humphries' three-point shot appears to be legit. He spent the entire offseason working on it, and after going 0-for-7 all last season, the 30-year-old went 2-for-4 from deep in Washington's preseason opener. Humphries is more athletic than Nene, a better defender in space, and he now has a more respectable outside shot. Right now he seems like the smart choice to start, at least until Jared Dudley returns from back surgery. Just spoke w/ Randy Wittman. Won't commit to Humphries as starting PF yet, and says Wiz might use multiple starting 5s. Bet here is Hump.